Welcome to KTM Paving Inc. Serving Minnesota and Wisconsin! Now Serving Five North Metro Communities! (Anoka, Chisago, Washington) Counties in Minnesota. (Polk & St. Croix) Counties in Wisconsin. 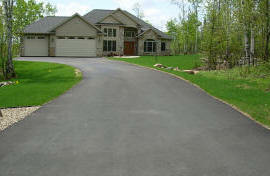 At KTM we strive to be the best asphalt contractor in the Northland. Where quality is never compromised and our prices remain very competitive. KTM has over 20 years of experience, which has built a reputation on delivering what we promise in a professional efficient manner. Our trained and friendly staff is prepared to make your experience with KTM's proficient, educational, and above all else satisfactory from the start of your project until the job is done right. Ken and Tim Maki started KTM in 2001 with 1 dump truck and have grown the business to employ 45 to 50 people during the summer seasons. KTM has successfully completed over 2,500 jobs since their beginning. Over 60% of our clients are from customer referrals. Customer service has been our goal with honest competitive pricing. At KTM Paving we also can assure a safe and drug free jobsite. Safety programs are mandated and attended throughout the year and we are able to retain skilled work crews each summer. KTM Paving has over 20 years of experience, that has built a reputation of excellence and delivering exactly what is promised…The Best job for your project! Let KTM Paving be the one to put in your new blacktop driveway. Be part of the large and fast growing KTM family. We’re definitely not satisfied until you are. Call us today for a free no-obligation consultation! © 2008 KTM Paving Inc. All Rights Reserved.